Update 10/25/11: Time marches on. I read these old posts and find myself in the interesting position of not remembering what I have written so it’s fresh -like seeing yourself from an others perspective. Not many times in life when you can look at yourself this way. I’m glad I started this madness. Enjoy, and as Giulietta owners like to say -keep the rev’s up! Update 11/10/09: Below was first posted on 6/26/08. I carry on with the projects and other pursuits. A new post is almost done. There are some Spiders (as usual) on eBay that deserve a quick mention but again, time has been precious. Update 2: Looking over all the cars I have numbers for it looks more likely that 101.02 cars have the new 001.02 engines while 101.05 cars have the 1315* series engines that are modified to accept the 101 engine series head. Update 1: 101.02 versus 101.05 is a market difference. I read in a reputable source that 101.05 was the model number for US Market Sprints. If you start looking carefully at the parts on your Giulietta Sprint, Sprint Veloce or Sprint Speciale you will notice there are a lot of numbers stamped, cast, engraved or written with grease pencil in Italian long-hand. These numbers tell you the year, model, and on early cars can match engine number to VIN number. The more subtle markings can shed a little light on how these cars were assembled and can be of great assistance when trying to identify what is correct for your car. I am going to focus on the vehicle identification numbers of Sprint and Sprint Veloce’s in this post and will look at the Engine numbers, Bertone numbers and Sprint Speciale specific numbers separately later. Tipo or type and series are the fundamental identifiers. Tipo is essentially the model name and series is the model number, which changed over time and for different markets. The first picture is the build plate for one of my cars. 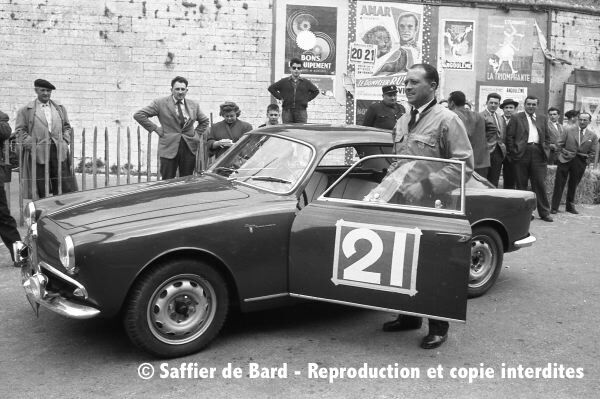 It is a Tipo: Giulietta Sprint, Series 101.05. It doesn’t actually say Sprint on the build plate, it’s sort of implied by the car itself that it is a Sprint. Several identifying numbers can be seen in this picture. 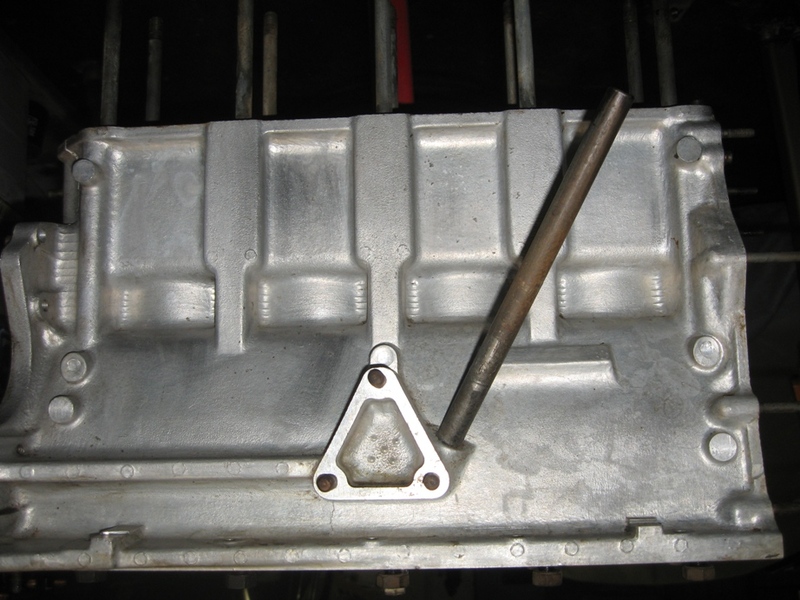 On the build plate are the Series, Autotelaio (VIN) and Motore (Engine) numbers. Above the plate, stamped in the body is the number Bertone used to identify the car during fabrication and assembly. The Autotelaio is also stamped on the firewall just below the bundle of wires that can be seen in this picture. Update 3/22/10: I have moved all of my photo files to Flickr so they would be harder to lose -these are about 10% pictures I’ve taken, 10% pictures readers like you have sent and the rest are pictures from classified ads, forums and the like that I saved. All these pictures have been linked to the vin’s of the cars they are of on the ‘Production and Register’ page. What’s the point? Well, if you’re looking for a picture of some part of a car, some original color, some option or references/examples to help inform you about a car, chances are you’ll find it among the pictures. If you have pictures of any cars to add I’d be glad to add it. This picture of a Sprint Veloce lightweight at the beginning of a race was one of those ‘where did it come from’ pictures I found when organizing. If you go to Christian-Claude you will see many interesting pictures like this from France. Hopefully they don’t mind me posting this since I am sending them traffic. Original post 4/2/09: I’ve been struggling with the layout of the production and register page the last few days but it is now fairly stable. Why go through the trouble you ask? The generally referenced production lists have flaws and don’t really address the numbering systems for US cars and this has led to a few restored cars I’ve come across with the wrong numbers stamped on their repro vin plates and in some cases owners who assume an engine is not original because its number doesn’t fall into the stated range for their vin. It appears that I have an opportunity to buy an 00120 block with a number appropriate to by SS. Exciting? Yes! Well, to help make it happen I am selling off some of the more interesting bits in my collection of spares. Among them is this block, a blank 101 1300 in fantastic condition. Before I get into the details of this particular block I should address the subject of blank blocks in general. I have seen these, or cars with them under the hood for sale occasionally and the story often attached to them is that Alfa’s procedure for catastrophic failure (thrown rod, broken main support web etc) called for the replacement of the parts with new factory parts. If the block was damaged, you got a new one. I don’t know if the replacements were short blocks, or blocks only to which any required parts were added to replace any unable to fulfill their role, but in any case, what came out the other side was an engine without an identity. Like that seen here. Why no number? Something to do with accounting perhaps. Maybe they were supposed to stamp the new block with the old blocks numbers, but the dealers never received the stamp set. Anyone know more? Starting from the part you see at the end of the build, the outside. You can see this is a pretty nice block. In better shape than any of the blocks I’ve built up before. I would paint the dipstick tube if I were building this. 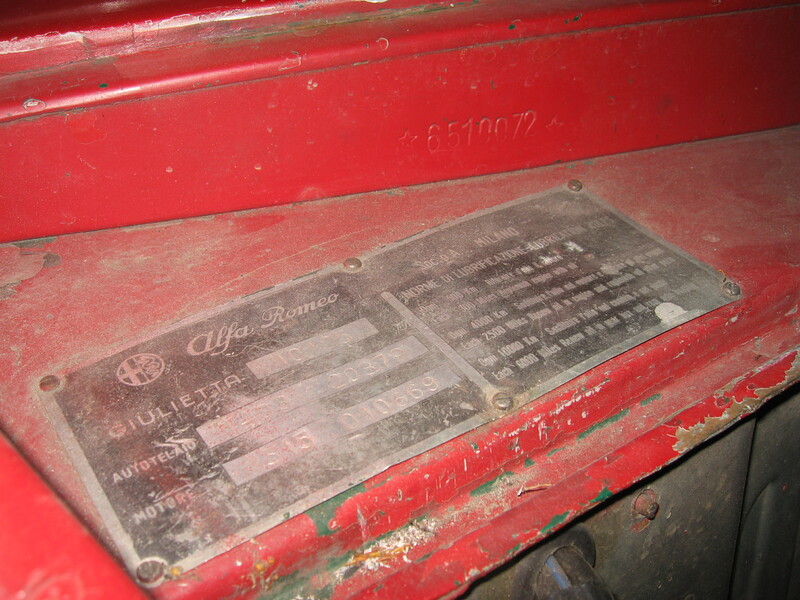 Other 1315 series Giulietta engine numbers. In 1955, with introduction of the Giulietta Berlina and Spider, an engine number series was started for each. For the Spider, engine numbers run from AR 1315*40001* through *45854* and for the Berlina AR 1315*50001* through *74950*. In 1956 The Sprint and Spider Veloce’s were introduced sharing the engine number series starting with AR 1315*30001* and running to *32738*. For 1957 an increased power version of the Berlina was introduced, the TI for ‘Turismo Internationale’ with an engine number range starting with AR 1315*80001* and running to *97834*. Oddly the series number for the TI is 753 rather than 750. I have read that the Romeo 2 van was being produced at this point with a Giulietta 1300 engine as an option and if so, it may have an engine number that is a variation on one of the above. Andrew Watry owns Giulietta Berlina 750C 1488 01774, engine number 1315*51850. Note the depth of the stamping effort in the vin plate. The early cars seem to have been more aggressively stamped or perhaps the earlier were done by hand and the later had some sort of jig. Manufacturing automobiles by hand is not a simple task. 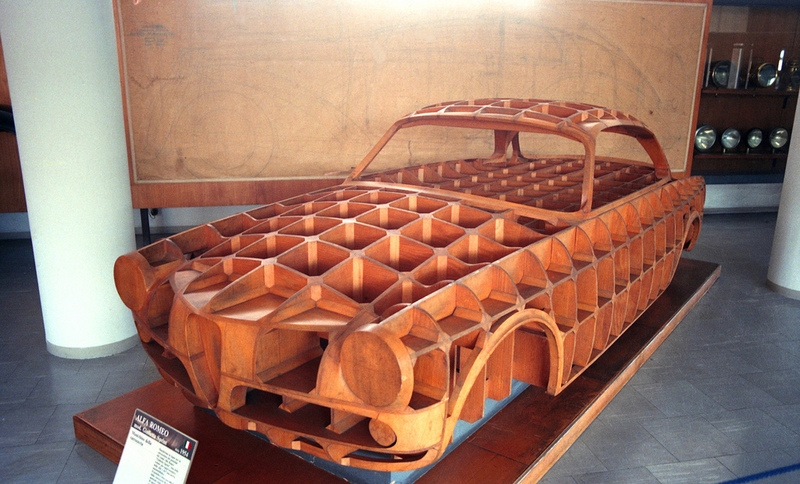 A large number of individual car specific parts have to find their way from sub-contractors and various corners of the shop to the car they were made to fit. To help make this happen Bertone assigned each car a number independent of the autotelaio number Alfa had earlier, or would later assign and all the parts requiring fettling to fit the individual car were marked with this number either by stamping or with grease pencil. It makes sense that this number would also be used for billing Alfa for bodies built so it’s likely that all the Bertone built Sprint prototypes had a Bertone body number. Here it is, the first Bertone number I ever encountered *6510072* corresponding to Autotealio 20379. The font of the punches used to stamp the body numbers never changed. This car also has 072 written in grease pencil on the underside of the hood. If you send an email to: ArchivioStorico@alfaromeo.com with a request for information regarding your Alfa they will get back to you with an email telling you what is in their records. I did this for my Sprint Speciale and this was their reply. with reference to your request we are informing you as follows. According to our documentation files, the chassis number AR 101.20.00413 originally corresponds to an Alfa Romeo Giulietta Sprint Speciale, manufactured on the 9th March 1961 and sold on the 13th March 1961 to Società per il Commercio dei Prodotti Alfa Romeo. Lugano, Switzerland. The body colour is Alfa red. I have seen a photograph of the pages from one of their records that was published in the ‘Giuliettaletta’ autumn 2007 issue and they are very neat to see. The particular record in the photo runs from October 2nd 1957 to November 22, 1957 and has details for cars 05433 to 05451, 19 cars, all written out in beautiful Italian long-hand. I recommend you join the Giulietta Register and request this issue if you want to see this spread.